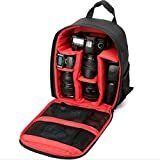 The main compartment holds a DSLR with lens attached while the modular dividers system will separate, organise and protect lenses, flashes and other accessories to suit your needs. This bag features an adjustable velcro multi-section divider system that allows for many configurations.External dimensions: 265x330x125 mm ; Internal dimensions: 230x300x110 mm. Various mesh pockets in the lid and in the front pocket, perfect for storing smaller accessories. This entry was posted in Discount Photography and tagged 33*12.5*26.5, Accessories, Antishock, Backpack, Black, Camera, Canon, DSLR, Fujifilm, Function., Multi, Nikon, Nylon, Olympus, Pentax, Photography, Rucksack, Samsung, Shoulder, Sony, Travelling., Waterproof by Ball Photo. Bookmark the permalink.